Freeware to view ImgBurn .ibg files. I don't know if it's a known bug, compare screenshots by BurnPlot 1.0.1.2 and DVDInfo below. IBG file attached also. 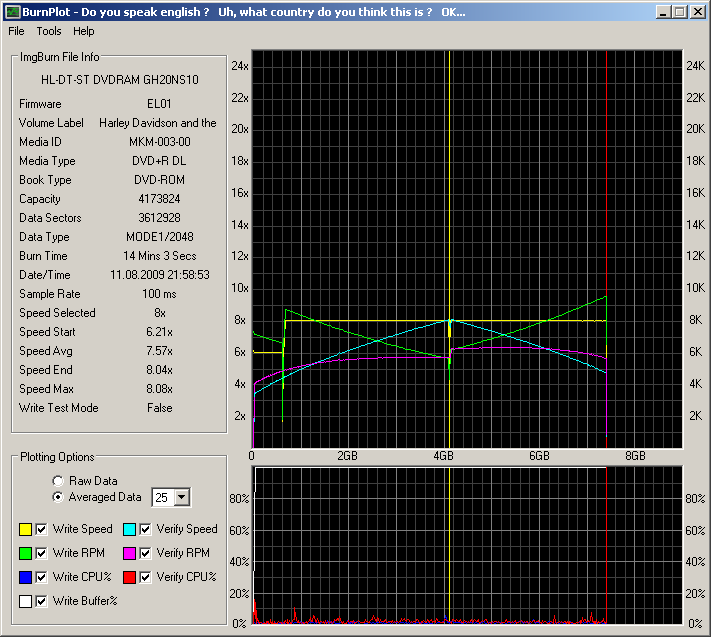 Yes, the RPM lines aren't correct yet. Perhaps this is being worked on... I dunno. @ Gleb Egorych - What are you refering to as a "known bug" ? The RPM plots, as LIGHTNING UK! pointed out, or something else ? Oh I see the layer break position is different too. As I understand different layer break/end positions come from different gigabyte size. Seems like DVDinfo uses 1024*1024*1000 byte gigabyte (thousand of megabytes) while BurnPlot uses 10^9 byte gigabyte. OptiDrive Control has proper 1024^3 byte gigabyte. @ Gleb Egorych - As you noted, the horizontal axis on BurnPlot is WYSIWYG - in the case of your example 9GB = 9,000,000,000 Bytes. The ImgBurn .ibg file records the sector at which the data was collected so to make plotting easier I base the horizontal axis on that value. Unfortunately, this system breaks down in the case of SL DVD's where the horizontal scale is shown as 4.5GB. When the media capacity sector value exceeds the calculated full scale axis value (4,500,000,000 / 2048 or current data type) then the number of horizontal axis divisions is set to the capacity sector value. @ LIGHTNING UK! - Let me know if this is deemed to be too inaccurate and I will revamp the horizontal scaling. It should really follow the cdspeed method of using 1024*1024 for MB and 1024*1024*1024 for GB properly. Then the max for SL can only ever be 4.37GB and 4.5GB gives you plenty to spare. @ LIGHTNING UK! - Changing the horizontal scaling to use a 1024^2 MB and 1024^3 GB is pretty simple but I seem to be missing some fundamental concept here. 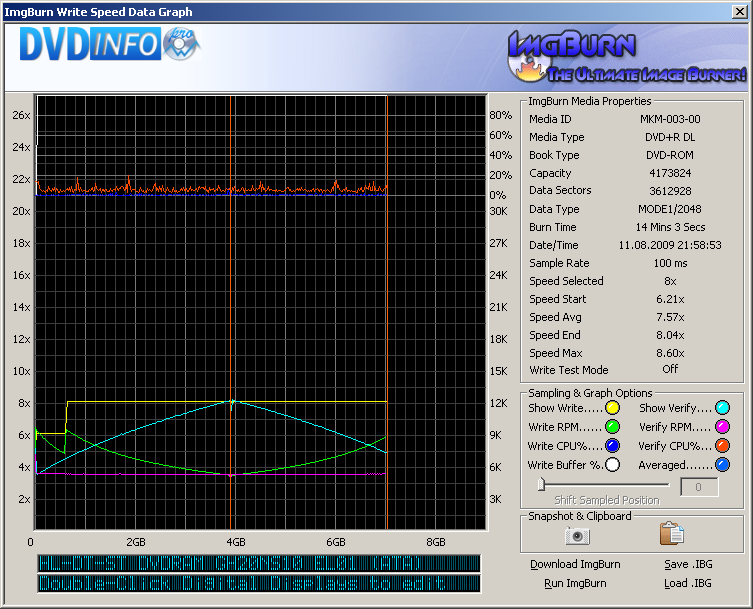 I place the layer break (yellow) and end of data (red) indicators at the sectors indicated in the ibg file. If you calculate their Byte value by multiplying the sector by the sector size you see that they fall on the horizontal axis exactly where they should. If I change the horizontal scaling they no longer fall where they should which tends to indicate the horizontal scale is no longer accurate. What am I missing ? Surely the 'where they should' depends on the multiplier used? How can it be 'wrong' if it's 'right' ? Back when I suggested you change the scale so DVD SL went up to 4.5GB, that was with me assuming the largest possible value was 4.37GB. @ LIGHTNING UK! 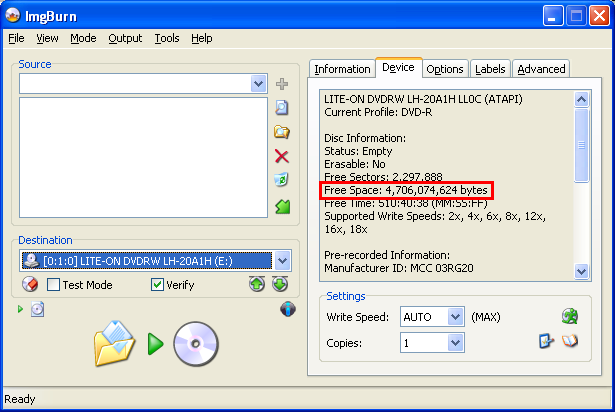 - I hate to be a newb here but you are confusing me when you say that a 4.7GB SL DVD can only contain 4.37GB. Why does ImgBurn tell me I have 4.7GB of space available when I select files to burn onto a SL DVD ? As shown in the Gleb Egorych ibg file the layer break is at sector 2,004,304 and he is putting 3,612,928 sectors of data onto the DVD. This is exactly where they are shown on the BurnPlot plots but not on the DVDInfoPro plots. Only one of these can be correct. If my calculations are wrong let me know what I need to do to correct them. Because 4.7GB == 4.37GiB. Where GB is decimal, as used by disc manufacturers, so that they can boast about bigger sizes of media, and GiB is binary, as normally used in computers and also reported by the OS for example (that's for example also the reason why a 640GB HDD is reported by the OS as 596GB only). When I use standard input in Build mode, ImgBurn 2.5.0.0 tells me how much space is available in bytes. In advanced input mode ImgBurn burn tells me that I have 4.38GB free - I have "Automatic Target Media" unchecked and "DVD+-R" selected s media space. So where did you see 4.7GB? Interesting quote from the above Wikipedia article - "A DVD-R can hold 4.7 GB." It looks like it comes down to semantics. You make the distinction between GB and GiB in your post. The horizontal scale on BurnPlot is labeled GB and, as far as I can tell, 1,000,000,000 Bytes / "GB" is technically correct. My way = 1,000,000,000 Bytes / "GB"
I am thinking of giving the user the ability to select the scaling type. Or... would you prefer I just change to the "right" way and be done with it ? @ Gleb Egorych - I am ri**ing a few movies right now. (I guess we don't mention that here.) I will burn them onto a disk tomorrow and take a screen capture to show you what I am talking about. ImgBurn uses 1024^x for MB and GB so using that method makes the most sense to me. It's up to you if you want it to be something the user can choose. As you can't fit 4.7GB into the 4.5GB horizontal scale, that should really be extended to 5GB if that method of calculation gets selected. @ LIGHTNING UK! - I decided to go cheap and cheerful with the rescaling. As you mentioned, I would need to change the SL DVD scale depending on the "GB" scalor selected and I didn't feel like monkeying around with it. DVDInfoPro apparently uses "GB" = 1024^2*1000 Bytes so the layer break and end of data indicators still won't look the same. @ Gleb Egorych - "ImgBurn 2.5.0.0 tells me how much space is available in bytes" - that's what I meant when I said it tells me I have 4.7GB of space available. (See image below.) I am pretty sure most newbs, like me, look at the number of bytes available and say "Well, the disk said 4.7GB and look I have 4.7GB available" not "Hey, let me divide that by 2^30 and see how many "GB" I have open on this disk". That's why I scaled the plots in Burnplot the way I did - so everything lined up the way most people saw the information in ImgBurn. Yes, it's OK now, thanks. The only problem - RPM plots, revilutions are definitely underestimated near center of disc. I had some spare time yesterday and decided to add a bell and/or whistle to the program. Added a pseudo CAD/CAM feel to this version - mouse over the plots and the sector and plot value information will be displayed. No real functional changes so I left the previous version available for download. I have started to work on multiple language capability. Is this implemented or not? There is a selection box in the settings as I can see. Ummm... No, not yet. I started to (Added "Tools/Settings/Language" to the UI.) but saw that the DKLang Localization Package LIGHTNING UK! used to add translation ability to ImgBurn was written in Delphi and kind of dropped the ball at that point. I assume that the DKLang Localization Package cannot be used with VB6. This requires me to hand create a source/base language file that can be edited with the DKLang Translation Editor and write a module to parse the translated language file. I still plan to do this but I haven't been able to get my head into it yet. Is ImgBurn written in Delphi or are you just using the DKLang Translation Editor to allow end users an easy way to translate the UI ? No, it's written in C++ Builder - but that can use Delphi components. I'm sure there must be a similar thing for VB though... just a case of hunting one down! Localization Guru Lite is free and works with VB. Thanks for the link Cynthia. I guess I got caught in the "let's use what LIGHTNING UK! used" frame of mind and never thought to look for something that would be compatible with VB. Looks like Localization Guru should be easy to implement. A lot easier than reinventing the wheel in order to use the DKLang Translation Editor used for ImgBurn translations. I'll let you know when I get it sussed out. Very nice program. As I read through this thread many of the concerns I had have already been addressed, but for the following. The attached file that was first posted HERE shows all the plotted information squished. Could this be improved by being able to manually and/or automatically scale the plot window to allow for viewing of the actual data? Here the data is plotted in an area that is less than a inch wide, with the remaining area nothing more than a large void. I don't own a Blu-ray drive so I don't know if things have improved, if not I could see this as a problem for those that choose to burn a little bit of data to large capacity media.